Professional wedding planner Mallory Shepard knows her job is challenging under any circumstances. But when the groom is your ex and someone invites murder, there may never be another tomorrow . . .
Mallory’s fine—really—handling the wedding arrangements for her ex, Keith. But his fiancée, Becca, has at the last minute decided to switch from a Japanese-cherry-blossom theme to a Gone with the Wind theme. She wants to honor her ailing grandmother, who owns an impressive collection of GWTW memorabilia—and who is fiercely at odds with the groom’s mother over the nuptial plans. But among other complications, Becca gets into a fight with an old childhood rival over a replica Scarlett O’Hara wedding gown. She wins the dress—but soon becomes a murder suspect when the other woman is found dead in Becca’s swimming pool. And it’s up to Mallory to solve the mystery behind this unhappy occasion, before a different kind of civil war breaks out . . . This is a great book. Mallory is a wedding planner with her sister Rachel. Mallory is putting a wedding together for her for her former boyfriend and the girl he was cheating with while they were engaged. It has been one mess up after the other with Helene, the fiancee's mother. She's running the show. Despite Helene, Keith's mother taking over and upsetting Becca, the wedding should go on as planned. Just throw in a secret marriage, an affair, stolen jewels, a Gone with the Wind fetish, along with two brides fighting over a Scarlett O'Hara wedding dress, several murders and you have a great business plan. It was a thriller mixed with unscrupulous people with some comedy thrown in. Who committed the murders and why? Several surprises in store for readers, including the ending. I loved the book. 5+ definitely. I received this book from Net Galley and Kensington Books for a honest review. The opinions expressed are my own. 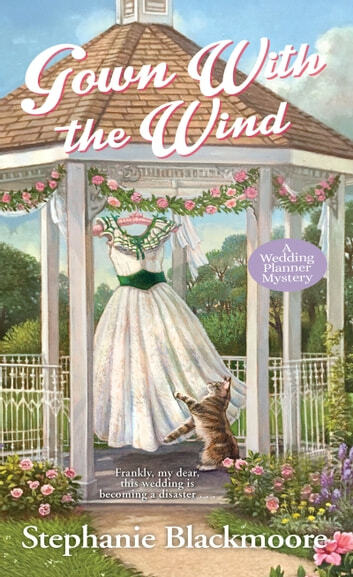 The 4th installment in the Wedding Planner Mystery series brings the past back for Mallory when she agrees to plan the wedding of her ex-fiance Keith and Becca, the woman he cheated on her with. Keith's mother is a whirlwind to deal with on top of the regular stress of wedding plans. When murder enters the picture, you're drawn in to the mystery and taken on a journey filled with twists and turns. A charming mystery! I do declare, I like this series! Mallory Shepard is planning the wedding of her ex fiancé and his new bride to be, Becca, after a last minute cancellation and boy is she glad she didn’t walk down the aisle with him. While she’s used to drama with the brides as they plan for their big day, this one takes the cake! First the bride’s grandmother, Alma, is found after being strangled by an intruder then her life long frenemy is found dead in her swimming pool, wearing Becca’s . It’s hard to tell who has the strongest motive for murder, but Mallory finds herself in the middle of it. Add to this Alma’s love for all things Gone With the Wind and you’ve got a truly eccentric family and even more motives for murder. Add in a large cast of potential suspects and you’ve got enough red herrings to keep your mind busy as Mallory and her sister Rachel work their way through solving who done it! 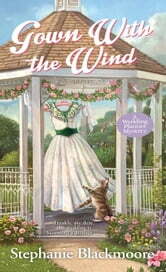 A delightful read and enjoyable cast of characters.